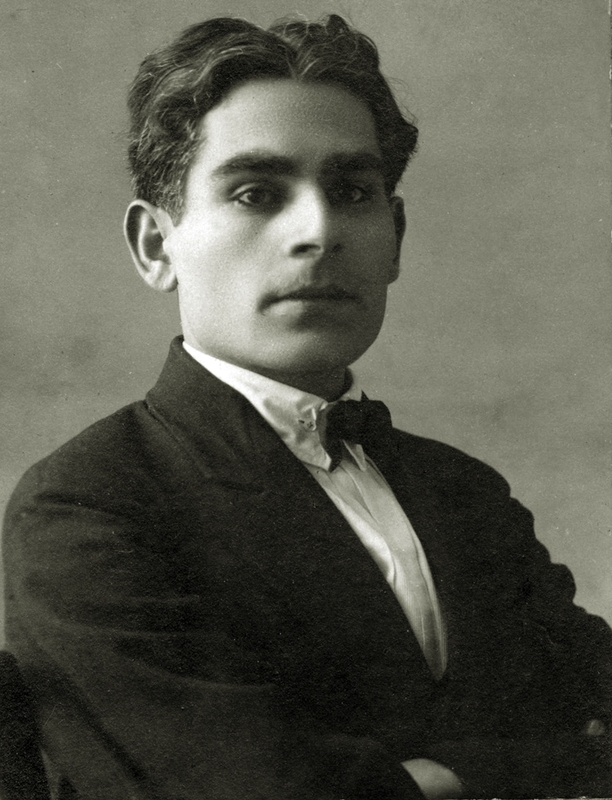 Lado Gudiashvili / ლადო გუდიაშვილი (1896-1980) was a 20th-century Georgian painter. Gudiashvili was born in Tiflis (now Tbilisi) on March 18 (30), 1896 into a family of a railroad employee. He studied in the Tiflis school of sculpture and fine art (1910-1914), where he met the Armenian artist Alexander Bazhbeuk-Melikyan, and later in Ronson's private academy in Paris (1919-1926). For a while, Gudiashvili belonged to a group of Georgian poets called "The Blue Horns" (1914-1918), who were trying to connect organically the Georgian national flavour with the creative structure of French symbolism. In Paris, he was a constant customer of the famous "La Ruche", a colony of painters where he met I. Zuloaga, Amedeo Modigliani, Natalia Goncharova, and Mikhail Larionov. Gudiashvili's work was greatly influenced by Niko Pirosmanashvili. Filled with the charm of Georgian life, the painter's early works combine dramatic grotesque with the charm of poetic mystery (Live Fish, 1920, Art Museum of Georgia). Closeness to the traditions of old Caucasian and Persian art was amplified upon his return to Georgia in 1926. Gudiashvili's colours become warmer, and the perception of the world as a theater grew stronger (many of Gudiashvili's paintings were either inspired by operas and balles or serve to depict actresses in costumes). 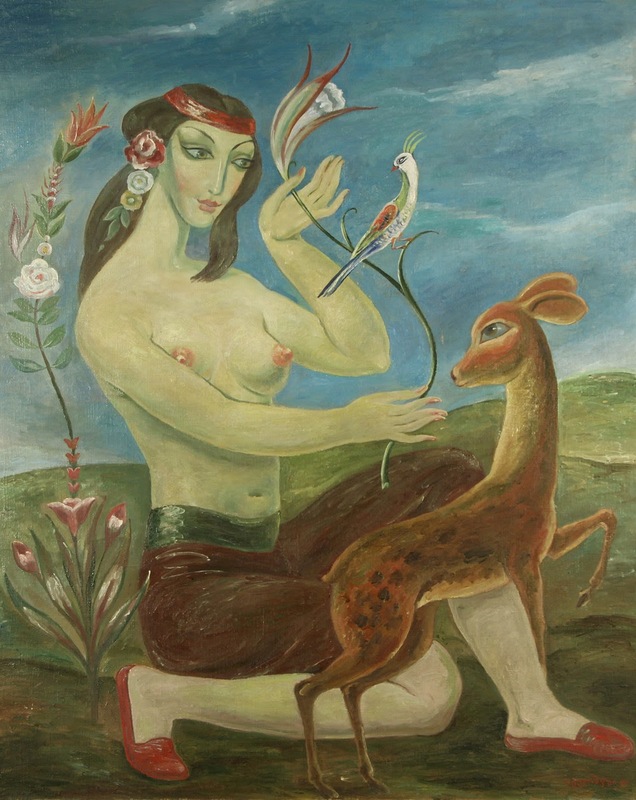 Like his compatriots (Grigol Robakidze, Konstantine Gamsakhurdia), Gudiashvili freely used mythological allegories (The Walk of Seraphita, 1940), the center of which was a graciously beautiful woman imagined as the mysterious "Goddess of the Earth". Gudiashvili also worked as a monumentalist, painting anew the Kashveti Church in Tbilisi in 1946, for which he was expelled from the Communist Party and fired from the Tbilisi academy of fine arts, where he had been teaching since 1926. In the voluminous "antifascist cycle" of Indian ink drawings Gudiashvili became a kind of "Georgian Goya": beastlike monsters surrounded the ruins of art and naked "goddesses" conveyed the ideas of the death of culture. Lado Gudiashvili worked also as a book illustrator, cinema and theater decorator. He died on July 20, 1980 in Tbilisi.